The Brits do many things right (sticky toffee pudding, a nice cup of tea and movies about children inhabiting a magical world, to name but a few) and they do many, many things differently—though not necessarily better—than we do (such as adding a redundant syllable to the word “aluminum” and using the term “redundant” to mean “laid off”) but there is one area where they are certainly, most definitely, wrong. Now, I don’t want to be too harsh on my host country, especially now while they are so emotionally fragile due to the loss of Mrs. Thatcher, so I’ll start off by pointing out something that they do right and the Americans do wrong: using flatware, or cutlery, while eating. The British, quite sensibly, put their forks in their left hands and just get on with it. I, however, resolutely retain the American way of eating, because I am an American, and this is what I do. I am questioned about this occasionally, and I usually give the story about how the American colonials, in an effort to separate themselves from all things English, devised this bizarre way of eating. For all I know, this might be true, and it satisfies my inquisitors: purposely inflicting a strange custom of dubious historical origins on oneself as a matter of national pride is something they can understand, sort of like Morris Dancing, or haggis. So, at the dining table, common sense wins out, but in the office, it all goes horribly pear-shaped. Binders. 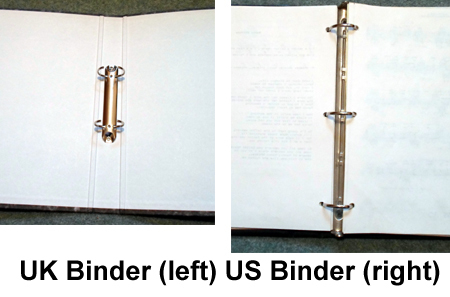 Binders with only two holes placed close together near the middle of the page. 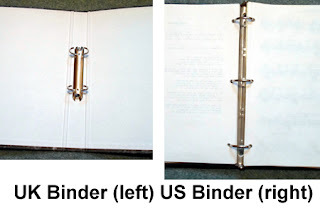 US binders have three holes—one at the top, one at the bottom and one in the center—as God intended. I am not saying this is “different” or that, in my opinion, the US way is better, I am stating, categorically, that—according to the laws of physics—this is wrong. 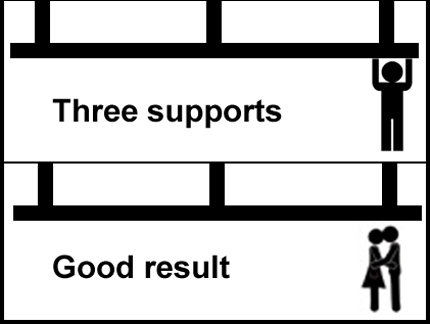 To demonstrate: if you suspend a long metal bar using two ropes near the middle of the bar, and then hang on one end, the results would not be satisfactory. If, instead, you used three ropes, the bar would be stable, and the pages would stop going askew and getting all rucked up and pulled out inadvertently and…I mean, you could hang on the bar without experiencing any surprises. Now that we have sorted this out, allow me to propose a solution: we will stop faffing about with our knives and forks at the dinner table if you will adopt a three-ring binder system. This will undeniably improve life in both of our countries. But keep the Morris dancers and the haggis; I’ve grown quite fond of them. Ah yes but you save a fortune in those little round reinforcers! No, you just have one less hole to save you. 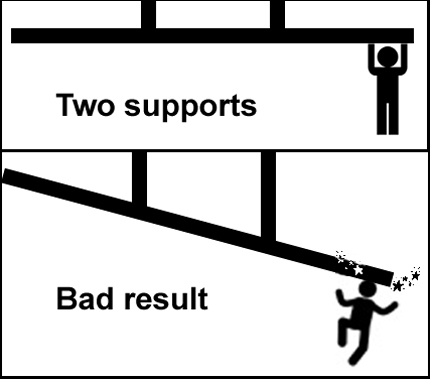 You use fewer reinforcers but you still use 'em. I can't help but wonder how the two-hole binder system got started. It is so obviously unsatisfactory! I also wonder how the fork-switching style of cutlery got started. It is a nuisance. I got your book ordered on my online Kindle. I love it! I quite agree about the binders, though you used to be able to get ones with four holes here. They were fine too. I often use cutlery the American way, as I prefer to eat with just a fork. If I'm eating a piece of meat or something else that requires lots of cutting up, though, I just do the British way. I can't be doing with swapping all the time. Maybe I'm a closet American, though I couldn't stand all those adverts on TV, so on second thoughts, maybe not. I sometimes eat the British way, but don't tell anyone. And American telly! Every time I go back for a visit it just boggles my mind how rubbish it is! Speaking as a left-handed person, I would have liked the two hole system and if we had it here in the US, today my handwriting would be legible. Bending my hand around that top clip on the paper in order to get ink on the page gave a permanent tilt to my handwriting. It has also caused me (and most of the lefties here) to hold a pen like it's a poorly engineered medieval gardening tool. I staunchly refuse to use a fork like a shovel - should always be in the left hand with prongs (that's not the correct word but I can't remember the right one for now) downwards i.e. facing the plate. Shovelling food seems to encourage speaking with the mouth full, not coming up for breath and food eaten at breakneck speed. But that's easy for me to say - I'm left handed. Couldn't agree with you more though about the ring-binder thingy - though will not begin to pretend that it was the equation which pursuaded me. I've not met you but I'll believe you anyway. Ha!